The ring is beautiful. She does not take it off. It is simple, yet elegant & classy just like her. The morganite is a beautiful stone that adds glamour & style to the engagement ring. Crafted from rose goldplated sterling silver for a dazzling display, this Miadora morganite engagement ring will lend sparkling romance to your look. The oval-cut morganite is flanked by diamond arches, and raised over a highly polished shank that has been encrusted with more white diamonds. Milgrain detailing on the edges of the shank completes the elegant look of this lovely engagement ring. Wasn't too sure about the rose plating. I prefer white metals. I put this on and was in love. It looks so much better on the hand than I expected. The rose color helps bring out the color in the stone. The size is perfect, not too big, not too small. It's been mistaken for an engagement ring. Sometimes the side stones detract but not with this ring. Absolutely LOVE it! This ring is dainty and stunning! I love everything about this ring. It is so dainty and looks great on my hand. I have small fingers and cannot wear large rings and this ring looks and fits just right. It is so light that I never take it off and never know that it is there, except when I happen to see it and it makes me happy that it is so pretty! This ring is just gorgeous. I get compliments from everyone who has seen it. It surpassed my expectations. 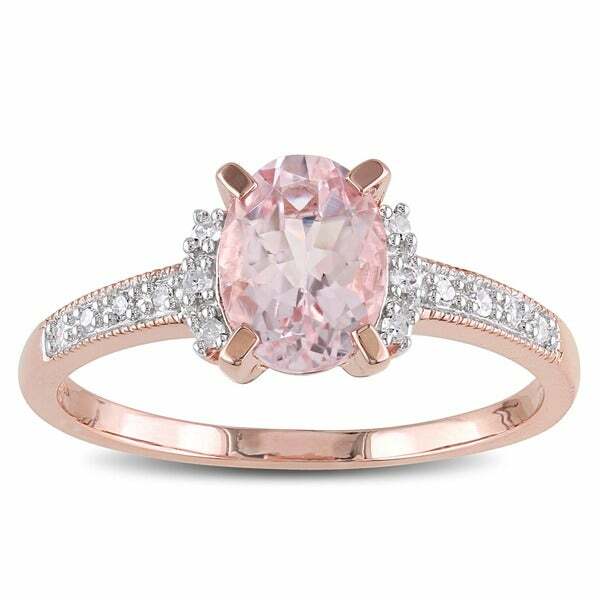 I highly recommend this Miadora Rose Goldplated Sterling Silver Oval-cut Morganite &amp; Diamond Accent Engagement Ring. It was my Valentine's Day gift to myself. I had been looking at it,and as I had gone back to see it again, "Flash Sale" popped up on the screen, well, that was all it took. I was thrilled the day it came, which just happened to be Valentine's Day. I love it. I think anyone who purchases this ring will be thrilled with it. I was leery setting this lovely stone in sterling instead of gold, but there is really no difference. The middle stone of morganite is clear and surprisingly larger then I thought for the price. I would recommend it to anyone who wants a beautiful medium sized ring. I love Morganite,but it is a very expensive stone. I decided to try this ring,and was very happy. The ring is even prettier than the picture. The size of the thing is perfect,not too small or large. I would recommend this ring. It is very light weight but it is very pretty and I will enjoy it. I have a oval diamond engagement ring and I love oval stones. Pink is my favorite color, which I could find matching studs. This ring is very comfortable to wear. The sizing is spot on and it looks just like the picture. When it arrived and I put it on, my husband said, "Wow, that looks expensive!" I really love this ring. It's just what I was looking for. It arrived quickly and in perfect condition. Stunning gentle sterling silver Morganite ring! Not too big, not too small with beautiful color and excellent stone cut. Would highly recommend! Thank you Miadora! Got this as a place holder until I received my actual engagement ring and I have to admit its prettier in person. It arrived in a timely fashion and when I opened the box this beautiful ring looked back at me. The center stone is a good size and its intensity in color is based on your complexion. The rose band shines like precious metal and although the center stones do not sparkle as much as I hoped they have moments when they stand out. I have had the ring for about a month and there are no flaws/damage to either of the stones or band. For an extra sheen soak the ring in alcohol once every few months. The ring is perfect if you have a slimmer finger as it is dainty and light in weight. It receives compliments all the time. So if you are considering this for a nontraditional bride or just as a gift, it's a great buy. Purchased ring after reading all product reviews & am very pleased! Like other reviewers with small fingers, ring looks great on (for reference, I bought the smallest size @ 5.5). Looks more expensive than the actual cost. The cut & clarity of the Morganite stone combined with the setting make this ring special. Would highly recommend!!! Love my new ring wanted some this with pink and this was it love it. Such a nice presentation this ring makes. It looks rich because it is well made with high quality materials. No one will know that you paid so little for it. Its comfortable to wear. I love the ring and wear it every day! It fits great and I get compliments all of the time. My Daughter was so surprised to recieve this for mothers day ! It was absolutely beautiful ! It looks perfect on her finger, and she will treasure it forever. I am so glad I decided on this purchase for my Grand Daughter to give this to my Daughter for Mothers Day ! Thank you Overstock.com !!!! sophisticated, polished, sparkling stone and good clarity. Beautiful Engagement ring. Definitely will recommend to a Friend. I love this ring just as it is, the pink really set it off. Classic design but side stones are small. Sized incorrectly or just runs big. Color was true to picture. Fit perfect amazingly beautiful too! "i bought this ring a few years ago...the pink on the band is gone and there is no shine to the main or side stones. how can i get shine back...that was a big selling point. i soak and rinse in soapy water then buff...nothing. thanks." Pink is gone because ring is gold plated over silver. Unfortunately, morganite is notoriously dull as a stone. The diamonds are not of the best quality, so that is why they don't shine. What you are doing is the best way to clean the ring. "Does the ring size run true to size? I wear size 8.5. Should I buy a size 9?" This ring runs true to size. "I have a question , i just bought it , and i wonder if this ring may oxide ( the metal become black ) by the time ? , thank you "
I am expecting, bought this to replace my wedding band as I have turned into an elephant. The rose gold basically washed off the 1st time I went swimming. I returned it. I have been wearing my ring and have not experienced any oxidation to date. Just my personal opinion, but it is a beautiful, delicate, very feminine piece of jewelry! "Can it be used for wedding band "
If you love it and your other loves it, why not? "I want to purchase this ring how do I go about it and how would I get it is that the final cost "
Contact us at 1 (800) 843-2446 for help with your order. "When purchasing this ring, I see that it only goes up to 9.5. Despite this is appearings when searching for a size 10 ring. can this ring be bough in a size 10?" This ring is offered in size 10. It's the first size listed from the options drop down box. "If the size isn't correct after receiving the order, can the ring be returned for a different size? " We accept returns on jewelry and watches within our Standard 30-day Return Policy. We will only accept items in new, unworn, and non-altered (including sizing) condition. We thoroughly inspect all jewelry and watch items before your refund is issued. Please see our Jewelry and Watch Returns Condition Policy chart below for more details.